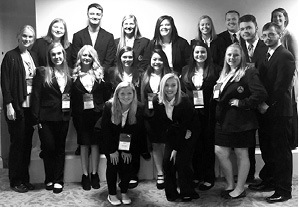 Several of the Clinton County Area Technology Center’s Health Occupation Students of America (HOSA) student-led organization along with their Instructors/Advisors Billie Frye, RN and Ashley King, RN attended the HOSA State Leadership Conference held in Louisville from March 21-23. Those attending and competing in the conference were: John Butler and Parker Barnett, CERT Skills Competition; Christina Collins, Garrett Page, Jennifer Ramirez and Kaylee Stearns, HOSA Bowl; Kilean Duvall, Prepared Speaking; Victoria Franklin, placed in the top five in the Job Seeking Skills Competition; Makenzie Kearney and Tristan Moons, Health Career Display; Haley Lowhorn, Human Growth and Development Knowledge Test and Voting Delegate; Kaytlen Matthews, Home Health Aide Competition; Angelina Pascual, HOSA Outstanding Chapter and Voting Delegate; Carlie Robbins, Nursing Assistant Competition; Emily Shelton, Medical Reading Knowledge Test and Voting Delegate; and Brandi Sparks, Medical Assisting. In addition to competing in various competitions, the students attending the HOSA Leadership Conference have the opportunity to visit college booths to learn more about the opportunities that each college offers, experience official HOSA meetings, vote on HOSA state officers, and interact with other health sciences students across the state. Hosa students and sponsors from the Clinton County Chapter who attended the annual state conference are pictured above. From left to right, they are: first row, Carlie Robbins and Makenzie Kerney. Second row: Mrs. Billie Frye, Emily Shelton, Kaytlen Matthews, Brandi Sparks, Jennifer Ramirez, Angelina Pascual, Victoria Franklin, and Kilean Duvall. Third row: Haley Lowhorn, Garrett Page, Christina Collins, Kaylee Stearns, Tristan Moons, Parker Barnett, John Butler, and Mrs. Ashley King.